I read Ancillary Justice earlier this year as an attempt to prepare myself for voting in the Hugo Awards for the first time. The results of the voting have just come in, and Ancillary Justice has won the Hugo Award, making it the first novel ever to win the Hugo, the Nebula, and the Arthur C. Clarke awards, considered by some to be the “triple crown” of the sci-fi and fantasy world. Ancillary Justice is Leckie’s first published novel, making this feat even more impressive. The non-linear structure of the story is confusing at first. It’s told in two parts, the present and a series of flashbacks. I don’t have page- or word-counts, but it felt like the flashbacks took up nearly as much of the novel as the present time viewpoints, and I’m not a huge fan of flashbacks. That being said, these flashbacks were written well. I was never confused as to where or when I was, a problem I’ve run into with many books in the past. The ideas behind the novel are very engaging, and Breq’s character most of all. She is–or was–an AI, capable of simultaneously inhabiting the bodies of hundreds, or even thousands of captives at once, allowing her to not only serve the crew herself as a ship (She is not allowed to be her own crew. ), but also maintain a presence on a nearby planet. We see much, much more of this in the flashback chapters, which makes them absolutely critical for an understanding of her current situation, where she had been broken off from the ship, and is trapped in a single one of the bodies she once inhabited, reducing her to something nearly human. Her struggle, an attempt to take revenge on the person–a term I use loosely here–who did this to her, has consumed her life since this event, and we meet her as she nears the point where she will have all of the tools she will need. Her drive for revenge is what pushes the novel along. However, I feel that it gets distracted in places. The flashback chapters start out by simply showing us the world–fascinating through the PoV of an AI, but still mostly exposition–and I had a hard time getting through the first part of the book. Also, Breq takes some side-trips on her journey to attain the items she needs that I didn’t see any reason for in the plot, which frustrated me. I felt the book itself could have been shorter, and would have benefitted from it, mostly from a pacing perspective. The ending was simultaneously satisfying and annoying. 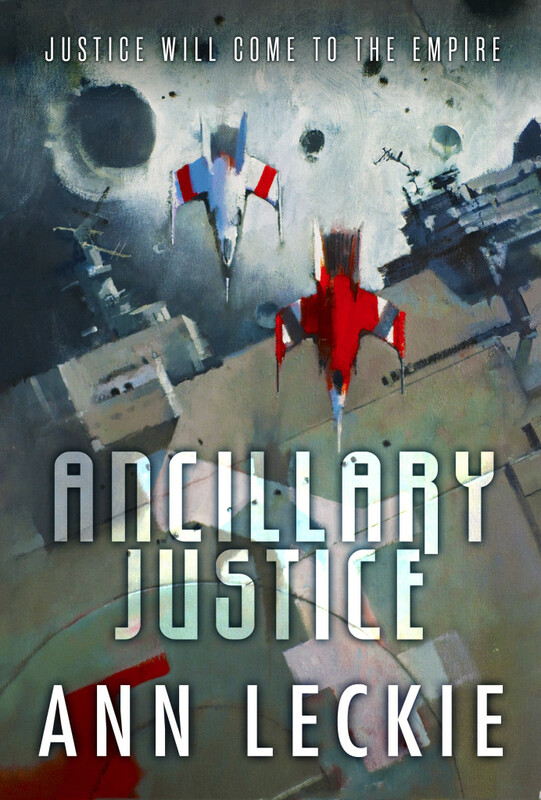 Ancillary Justice is the first book in a planned trilogy. The second book, Ancillary Sword, comes out on October 7th, less than two months from now. Ancillary Justice doesn’t tie up as many threads as I was hoping it would, but it does seem like it will fit well into the context of the trilogy. I’ll be getting the other books as they come out. I’m hoping the second book will be structured a little differently, with more action and less time on flashbacks. I can’t say much more about the ending without spoilers, so you’ll have to read it yourself to understand what I’m saying. No review of Ancillary Justice would be complete without talking about the “pronoun thing”. In the language of the Radch, In which Breq thinks and speaks, all sentient beings are referred to as “she”, regardless of other considerations. This becomes apparent when Breq is required to interact with those outside of the empire, and often becomes confused by which pronoun to use. She notes that it is easier to just use one, and that it is often confusing to try to distinguish male and female among the many species which inhabit the galaxy, many of which have different visible sexual dimorphisms, or at times none at all. This use has been praised by many in the SF/F community as progressive, and it is one of the reasons why the book has won so many awards over the past year. I personally found it to be an interesting–if distracting–world-building element an the beginning, which blended into the universe by the end of the story. I would be very interested to see how they would handle this in a movie or television adaptation of the series, where the viewers would have visual cues on the genders of the characters. Verdict: Well worth the read, and I have no problems with Ancillary Justice winning the awards it did (Though I was pulling for The Wheel of Time for the Hugo. ), as it was well written and contained some absolutely brilliant ideas. I found the flashbacks to be info-heavy, the pacing sometimes slow, and the ending slightly dissatisfying (Though it’s the first in a series, so it’s understandable.). The characters were well written, and the central conflict seemed very realistic. I’d recommend, but it’s not at the top of my list. Four out of Five stars. It’ll be interesting to see how Ancillary Sword does in next year’s awards.